Freeport, Grand Bahama - As the dates for the 2013 Ft. Lauderdale Film Festival on Location: Grand Bahama Island (FLIFF), are quickly approaching, sponsors and organizers are busy promoting the event within local and national high schools throughout the country. As The Grand Bahama Port Authority, Limited (GBPA) participating as a major sponsor for the High School Film Competition, Corporate Affairs Officer for GBPA and Project Liaison, Kendra Clarke, made visits to several local high schools recently, encouraging student participation for the upcoming competition. High School, College and Open. 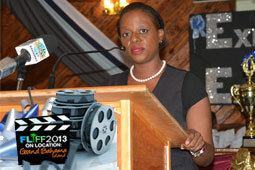 The deadline for all BAHAMIAN FILM submissions is OCTOBER 11, 2013. 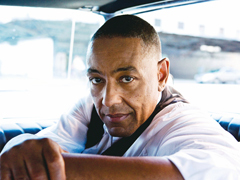 Freeport, Bahamas - Giancarlo Esposito, the film, stage and TV star was in Grand Bahama Island to receive a career achievement award at FLIFF On Location: Grand Bahama Island, an offshoot of the Fort Lauderdale International Film Festival. The event was held at the Pelican Bay Hotel and is a three year collaboration with the Bahamas Ministry of Tourism. Freeport, Bahamas - The 4 day film festival, FLIFF On Location: Grand Bahama Island wrapped on Sunday, October 28th with an awards ceremony and official closing at the Pelican Bay Hotel's Canal House after what organizers could thankfully say was a successful event despite the effects of Hurricane Sandy. Freeport, Bahamas - Despite weather conditions affected by Hurricane Sandy, an excellent turnout resulted for opening night of FLIFF On Location: Grand Bahama Island. The originally planned outdoor screening moved indoors to the host site, the Canal House at Pelican Bay Hotel for the family movie, Sammy 2: Escape to Paradise which was thoroughly enjoyed by those that came out in the storm. The festival was officially opened by the organizers, and Donvarcia Duncombe sang both the Bahamian and American national anthems after an opening prayer. Freeport Bahamas - Due to Hurricane Sandy, the outdoor screening and opening ceremony originally planned for this evening has been relocated to Canal House, Pelican Bay Hotel. The Friday night screening of Sammy 2 planned for Port Lucaya Marketplace will now be screened on Sunday, October 28th at 7pm. Freeport, Bahamas - Filmmakers screening at the Fort Lauderdale International Film Festival will be arriving in Grand Bahama for FLIFF On Location Take 2 on Thursday, October 25th and among them will be Academy Award winning director, Stefan Ruzowitzky who will screen his latest thriller, Deadfall starring Eric Bana, Olivia Wilde, Sissy Spacek, Kris Kristofferson, Treat Williams, Charlie Hunnam, Kate Mara. Freeport, Grand Bahama Island - Organizers of FLIFF on Location: Grand Bahama Island are pleased to announce the Blue Ribbon Panel selection for the High School Category for Bahamian films. Sunland Baptist Academy's grade 12 submission of "The Blame" has been chosen as this year's best student film. Freeport, Bahamas - A press conference to announce FLIFF Take 2 took place on October 18th at the Pelican Bay Hotel Canal House to update the media and public on the film festival which is set to get underway on October 25th and continue through to October 28th. 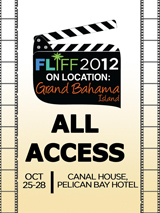 Freeport, Bahamas - Tickets are now on sale for FLIFF On Location: Grand Bahama Island! Become a film buff from October 25th through 28th as we celebrate international and local film making at the Canal House at Pelican Bay Hotel. Freeport, Bahamas - FLIFF On Location: Grand Bahama Island is pleased to announce that Ian Gregory Strachan, writer, producer and director of the television series, “Gippie’s Kingdom" will be offering a workshop during FLIFF for aspiring filmmakers called, Stories That Matter" on 10:30am at the Pelican Bay Canal House on Saturday, October 27th. All participating local film makers in the three competition categories (high school, college and open) and anyone interested in film making are invited to attend (admittance by an All Access, Fast Pass or All Movies All Day pass). Freeport, Bahamas - Organizers of FLIFF On Location: Grand Bahama Island are pleased to present the official schedule for the 4-day event from October 25th through 28th. All Access passes are now on sale for FLIFF On Location: Grand Bahama Island and the other passes will be available onward from Monday, October 15th. 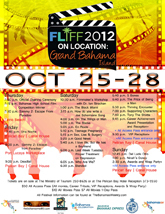 Freeport, Grand Bahama Island - FLIFF on Location: Grand Bahama Island 2012 will take place in Freeport from October 25 – 28th. Celebrated actors, directors, producers and writers will once again arrive by sea and air from the Fort Lauderdale International Film Festival (FLIFF) and film fans will have an opportunity to meet them and view a variety of international films, along with Bahamian-made films. Destined to be an unforgettable night out for the entire family, and set against the idyllic backdrop of the Bahamian waters, FLIFF On Location: Grand Bahama Island is pleased to announce their opening night film, Sammy 2: Escape from Paradise, a 3D animation which will be projected onto a 30' screen outdoors at Taino Beach on Thursday, October 25th. Fort Lauderdale, FLORIDA - The 27th Annual Fort Lauderdale International Film Festival (FLIFF) announced its official line-up for the 27th Annual event, October 19 – November 11, 2012. Of the 200 films the festival presents, 78 are premieres including 14 World Premieres, 2 North American, 6 U.S. Premieres, 3 East Coast, 31 Southeast and 22 Florida. “This year FLiFF has one of the most exciting film line-ups in our history. There are a number of films with all-star casts, a feature film directorial debut by one of our most revered actor. 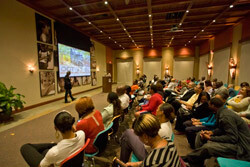 The documentaries are enlightening and engaging; some controversial, others political and some..."
Freeport, Grand Bahama Island - FLIFF on Location: Grand Bahama Island 2012 will take place in Freeport from October 25 – 28 at the Pelican Bay Hotel in their state-of-the-art Canal House facility. Celebrated actors, directors, producers and writers will once again arrive by sea and air from the Fort Lauderdale International Film Festival (FLIFF) and film fans will have an opportunity to meet them and view a variety of international films, along with Bahamian-made films.